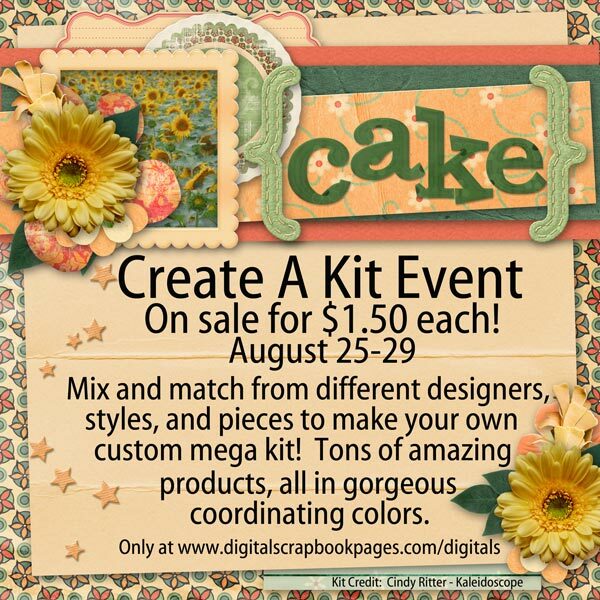 Our August CAKE (Create A Kit Event) features sweet summer citrus colors that are to die for, and you can create your own custom mega kit from your choice of sets on sale for $1.50 each, August 25 – 28. This is your chance to build your own custom mega kit with these smooth and fun colors. Choose from tons of coordinating papers, elements, clusters, quickpages, word art and more. We have lots of styles to suit your personal taste, and lots of general designs that you can use in almost any type of layout. Be sure to pick up a bundle at the low price of just $1.50 per set! And look for our next CAKE featuring bright fall colors starting September 22. I am really excited about this CAKE event! The colors are so yummy I had a hard time stopping! The ad above was created by Beth Ervin using pieces of my Kaleidoscope Collection, created just for this months CAKE! Thanks Beth! Make sure to stop by Digitals tomorrow and pick up one kit or several, so many beautiful choices! Here’s a little treat for you to give you a peek at what I have in store for you… The lovely cluster is created by Judith of my CT using pieces from the Kaleidoscope Collection… enjoy! Thanks Judith! This entry was posted in Design News, Digiscrap, Digital Scrapbooking, Freebies, New Releases, Sales and Specials and tagged Create A Kit Event at Digitals, digiscrap, Digitals Scrapbook Pages, freebie, Kaleidoscope, New Release, Summer Colors. Bookmark the permalink.